So What’s the Longest Losing Streak In Eagles History? It’s looking right now that the Eagles might honestly not win another game this year. If that is in fact the case, they will end the season with 12 straight losses. That would bring them close to the team record, and it would set a record for most consecutive losses in one season. 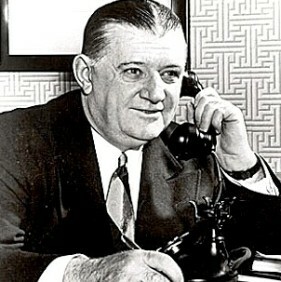 1936 was the first year that the NFL had a draft, which was done on the insistence of Eagles owner and coach Bert Bell (left), whose team had gone 2-9 the year before. Bell not only made the first selection of the draft as owner of the Eagles, he acted as emcee for the evening, as the draft was held at the Ritz Carlton in Philadelphia! With their first pick, the Eagles selected the first ever winner of the Heisman Trophy, Jay Berwanger. (Incidentally, with the 3rd pick of the draft, the Pittsburgh Pirates selected a player named William Shakespeare, who had possibly the greatest nickname in NFL history: “The Merchant of Menace”). But the Eagles couldn’t meet Berwanger’s money demands, and he was traded to the Bears (he never signed with them either). Much like the Eagles now, whose inability to sign even moderately effective offensive lineman has cost them the season, in 1936 their inability to sign a player of Berwanger’s ability hurt them greatly, both on the field and at the box office. 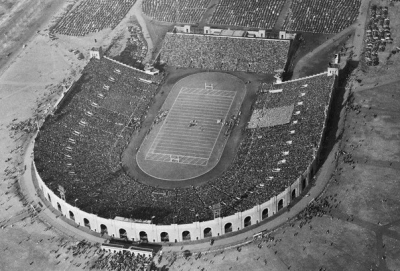 The season started promisingly enough, with a 10-7 win over the New York Giants at Municipal Stadium (below right). Then things went downhill, and fast. In their next 5 games, they were outscored 101-3. Finally, in week 7, they scored their second TD of the season, but still lost to the Boston Redskins, 17-7. The next week, they cracked double digits again, again versus the Giants, but lost a shootout 21-17. They then went on to score a total of 2 TDs for the rest of the season to finish 1-11, with 11 straight losses. They were outscored that season 206-51, with over half of their points coming in two games against the Giants. Their stats for the 1936 season are absolutely hilarious. They had 8 different players throw at least one pass that season. These QBs combined to complete 22.9% of their passes for 603 yards, with 3 Touchdowns and 36 interceptions. The Eagles completed 39 passes that year, and threw 36 interceptions. Not a good year for the likes of Swede Hanson, Stumpy Thomason, and Reds Bassman. The leading receiver on that team was Eggs Manske with 325 yards. Hanson led the team in rushing. 1937 started out no better. They lost their first 3 games, then broke their losing streak at 14 with a thrilling 6-6 tie against the Chicago Cardinals. They would lose the next week, then finally go into Washington, where the Redskins were playing their first season after moving from Boston, and win 14-0. They would finish the 1937 season 2-8-1. Between the Phillies, Eagles, and rapidly dissolving As, team sports really could not have been worse in this city in the late 1930s. Was the Depression not enough?